Since the days of its founding during industrial growth, Ghent has adapted to social and environmental changes, from housing shortages to the reality of living at sea level. 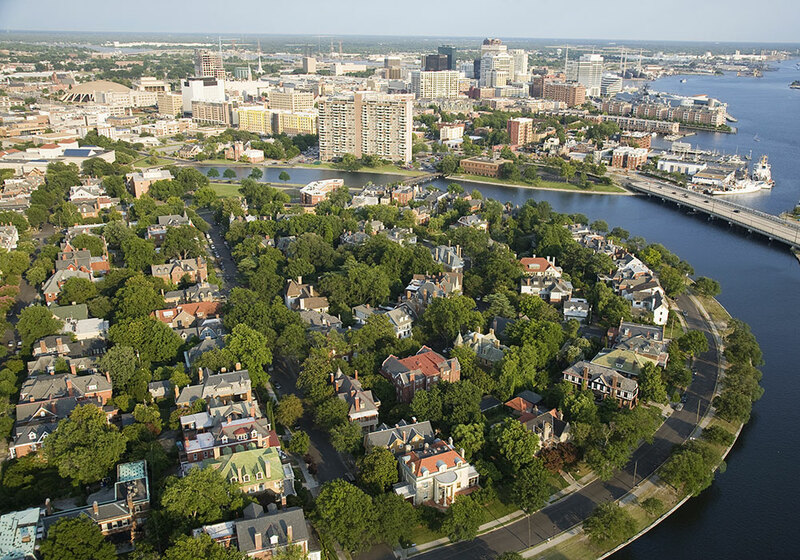 The Norfolk, Virginia, neighborhood is a diverse community that is facing the challenges of sea level rise while striving toward social and environmental resilience. Ghent is modeled after the Belgian city of the same name. The Hague features the waterfront arch of its namesake in the Netherlands. Photo courtesy VisitNorfolk. As Norfolk was experiencing a surge of growth in the late 19th century, Ghent was developed as an early suburb connected to the city by the streetcar system. The Norfolk Company surveyed and platted the land for single-family homes, and hired John Graham, a civil engineer from Philadelphia, to design the new high-end suburb. Ghent was laid out in a grid pattern, with an emphasis on broad tree-lined avenues, large areas of green space, and a series of waterfront arches created by filling in portions of the shoreline of Smith’s Creek. The housing shortage during and after World War II led to overcrowding in homes divided to create boarding housing and apartments. To alleviate the health and sanitary issues of overcrowded living conditions, the city razed and redeveloped Ghent Square during urban renewal from the 1940s to the 1970s. In the face of new development, the city designated Ghent as a conservation area, provided rehabilitation funds, and developed local historic district zoning that required new developments and exterior alterations to fit the style of the surrounding houses and neighborhood. With these guidelines, Ghent Square was named the nation’s best large-scale residential development by the Urban Land Institute in 1991. The surviving portions of Ghent and North Ghent are listed on the National Register of Historic Places (1980 and 2001), demonstrating a diversity of architectural styles. The thoughtful redevelopment and preservation created further impetus for conservation and improvement in the remainder of Ghent. Today, there is a mix of housing types built at a similar scale, creating an economically diverse community. 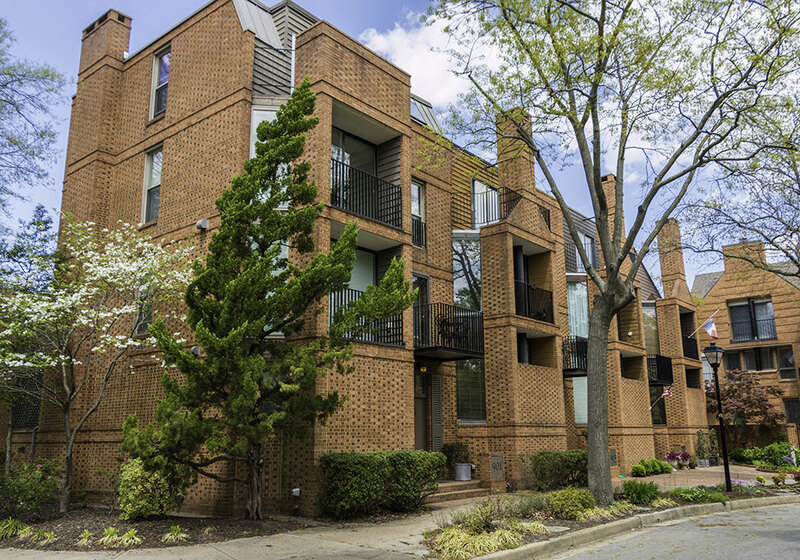 The Ghent Square Community seamlessly transitions from historic Ghent. Photo courtesy City of Norfolk. 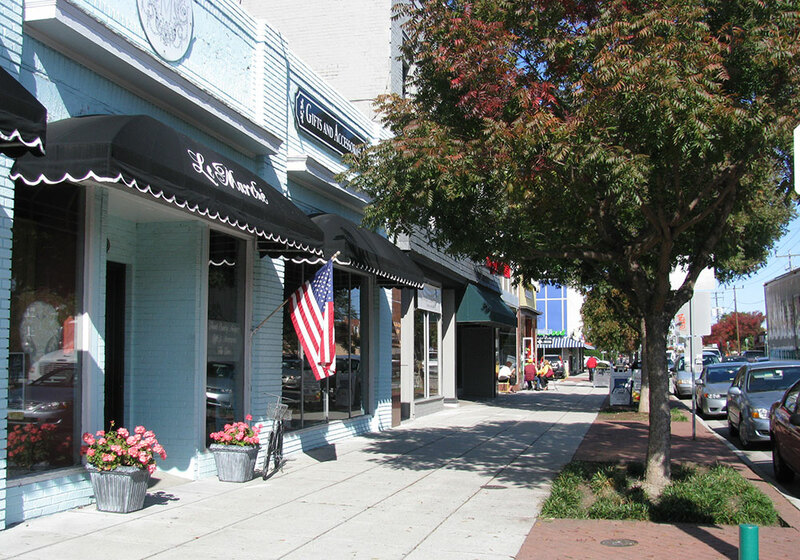 Ghent hosts a range of neighborhood- and region-serving commercial establishments. A pedestrian commercial overlay zoning district was added to the Colley Avenue and 21st Street commercial areas to maintain the existing sidewalks, and to ensure that new construction and property renovations continue to enhance the safety of pedestrians. Public greenspace is incorporated throughout the entire district — linear parks and gardens, dog parks, and a waterfront parkway, inviting residents to enjoy outside recreation in addition to walking to popular destinations, such as museums, movie theater, restaurants and retail. While the scalloped waterfront may add to the charm of Ghent, the ramifications of sea level rise — increasing tidal, nuisance, and storm event flooding — have been challenging. The City of Norfolk is at the forefront in addressing these challenges, including efforts in Ghent. Design work is under way for a Hague wetland construction project aimed at improving water quality and quantity issues. Together with the U.S. Army Corps of Engineers, the city is exploring options to protect the neighborhood against inundation from tidal surge. Neighborhood residents have taken an active role in addressing flooding by sponsoring workshops to educate residents about what they can do to address flooding through proactive approaches, such as rain barrels and rain gardens, and the importance of obtaining flood insurance. Any new construction or substantial rehabilitation in Ghent will have to comply with Norfolk’s new zoning requirements that address resilience measures. Local historic district zoning was enacted (Ghent Historic Cultural Conservation Districts) preserve architectural character. Pedestrian Commercial Overlay zoning district was added to the Colley Avenue and 21st Street commercial areas to allow pedestrian oriented commercial activities within the neighborhood. Walkable destinations include the Chrysler Museum, Harrison Opera House, movie theater, restaurants, retail. Ghent has a wide range of housing types — single family, townhomes, multifamily buildings — creating an economically diverse community. Greenery adds to the character of the neighborhood in a series of linear parks and gardens, a dog park, and waterfront walkway. Ghent boasts an original complete grid of sidewalks, which are in most cases separated from traffic by 10 or more feet of landscaped verge and on-street parking, contributing to the safety of the area. Ghent and North Ghent, both areas within the larger Ghent neighborhood, are listed on National Register of Historic Places (1980 and 2001), with over 500 contributing structures, including several historic churches and synagogues. The neighborhood of Ghent is broadly defined by Brambleton Avenue to the south, Hampton Boulevard to the west, railroad tracks to the north, and Granby Street to the east. Ghent hosts the region’s premier neighborhood commercial corridor, Colley Avenue. Photo courtesy Norfolk Department of City Planning.